"Lord, I've ruined my life. I'm Yours, if You still want me." Deeply wounded in his childhood and struggling to come to terms with failed relationships, Jim Stier wondered if God could ever use a life as fractured as his. Indeed God would use him -- in ways that Jim could never have imagined. Confronted with the opportunity to deny his Savior, Jim surrendered his life, with all of its pain, to God. So began an inspiring journey of struggle, faith, and victory that ultimately led to the lost, hurting people of Brazil and beyond. 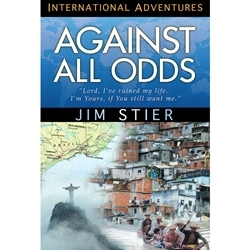 Against All Odds is a compelling reminder that God restores broken lives and broken dreams. This story of one man's passion to see a nation transformed is a stunning testimony that Christ's grace and mercy can redeem any life surrendered to Him.